The 6 mil Premium Clear Static Cling Oil Change Stickers are the traditional materials most people are familiar with. Static cling stickers are everywhere. 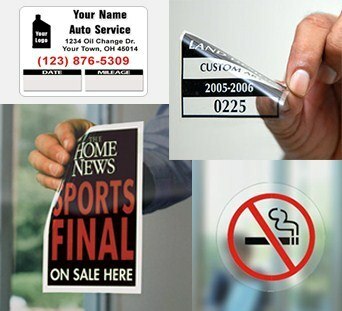 Store displays, price stickers (which we wish all mirror manufacturer's would use), decorative window applications, and especially Oil Change Stickers. 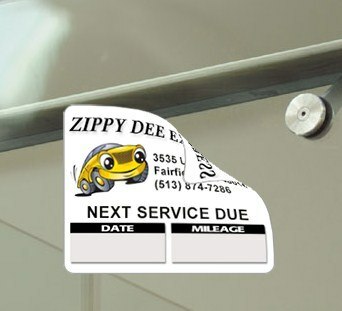 Static-cling vinyl’s lack of adhesive allows easy repositioning and removal of printed graphics. We use only 6 mil, premium static cling vinyl, from Fasson® / Avery Dennison. Static dyne levels are high, ensuring the quality of print is excellent and your static oil change stickers hold onto your customer's windshields. Above you will find a material specification sheet for the static cling vinyl. Sure, you may not understand all of the measurements and quality points that are ensured, but you will see that we're serious about this... and your satisfaction. 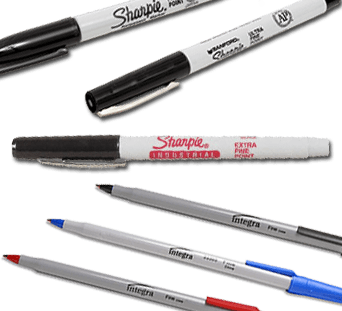 A standard pen or marker can be used on your static oil stickers that you receive from Oil-Change-Sticker.com. FOR OPTIMUM RESULTS: We recommend using a Ball Point Ink Pen, a Paint Pen or a Sharpie Industrial Extra Fine Point Marker. We include a FREE Sharpie Industrial Marker with every Custom Oil Change Sticker order!! Quality materials are an absolute must. Static cling oil change sticker material must be new, fresh and pliable, not to mention be properly charged in order to preform properly when you receive and use them. We print a ton of static oil stickers, so we always have new material coming in our doors, and straight back out the door to you. It's static. There is no adhesive, so there is no possibility of residues to be left behind. All you'll get with these bad boys is a high quality cling. Tradition is important. 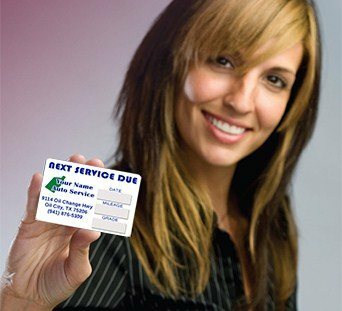 Your customers appreciate the consistency and dependability of a quality static oil change sticker. This eliminates their concern of what they think may leave adhesive residue on their window. With these premium 6 mil static cling oil change stickers, you and your customers will be very happy. 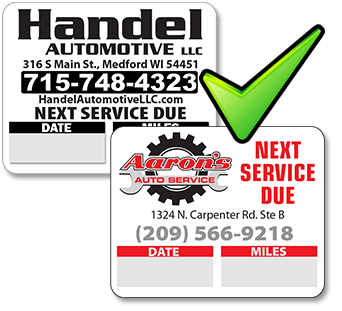 Your static oil change stickers are an important part of your marketing and advertising strategy. The money that you spend on a quality, dependable material is going to go a long way. You've heard it said before, "Free is worthless if it doesn't work". 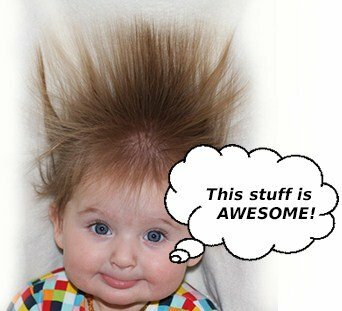 The value that you will receive from Oil-Change-Sticker.com is tremendous. Take advantage of it.